Are you clearing-impaired? Yes, you heard me right. A new advertising campaign is using humor to encourage employers to hire people with disabilities. 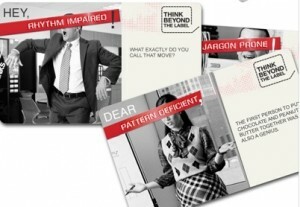 In Think Beyond The Label, workers are shown as having quirky impairments ranging from being a fashion disaster (“pattern-deficient”) to having two left feet on the dance floor (“rhythm-impaired”). The point is to shed the labels given to people and look instead at what value they can bring to a company. This campaign has clout, because instead of having a public service announcement format that is typical of such disability awareness ads, Think Beyond The Label has an estimated budget of $4 million for the first two quarters of 2010, according to The New York Times. It’s being spearheaded by Health & Disability Advocates, a nonprofit organization that is working on behalf of more than 25 state vocational rehabilitation agencies. Stuart Elliot, The New York Times‘ Advertising writer says the campaign “takes a light-hearted tack rather than a sober or earnest tone … to challenge conventional wisdom about workers with disabilities.” The T.V. ads, which were created by Chicago-based ad agency Wirestone, will appear on Sunday news programs on ABC, NBC and CBS, and on cable channels like BBC America, CNN, ESPN and HLN, according to The New York Times. Print ads will also appear newspapers and magazines, including Fortune and The Wall Street Journal, while online ads will run on sites such as ESPN.com and WSJ.com. Watch one T.V. commercial here. The website also has business case for hiring people with disabilities, and refutes myths about employing this community. Among the many reasons to hire a person with a disability: Product and service innovation, finding new marketing opportunities and increased retention rates. These ads are definitely different, and I hope this campaign spurs companies to look beyond the wheelchair, hearing aid and walking cane to see a disabled person’s real talents. See how some companies already are.